Wedding receptions at Latrobe's on Royal in the French Quarter will usually have the wedding cake located in the circular room that is between the main ballroom where most of the reception action occurs, and the enclosed courtyard, where wedding ceremonies usually take place (and which also serves as additional reception space). This is a great spot for the cake, as it's centrally located, while not being in the way or impeding the movement of guests as it would in the more crowded main space. It's always preferable from a photography standpoint to not have the cake directly against a wall, so that the couple can be mostly behind the cake (rather than off to the side of it) when cutting. 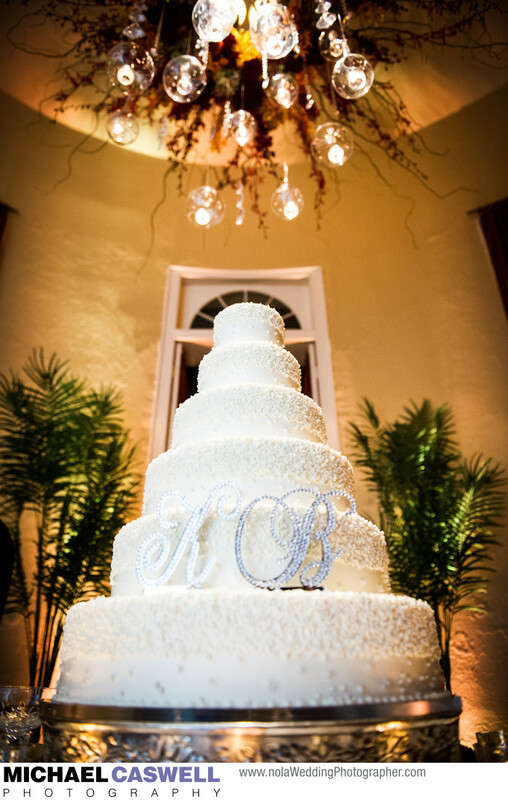 And aesthetically, it looks pleasing to the eye to have the cake in the center of a round room. Additionally, this room is spacious enough to accommodate other things such as the groom's cake, a bananas foster station, a table seating placecard display, and a table of other desert items. This delicious and gorgeous cake was created by Royal Cakery. Owner Shirelle Royal runs one of the best bakeries in New Orleans, and her creations are always amazing and delicious! The cake table was also highlighted by a beautiful floral and candle arrangement hanging above, crafted by Bella Blooms, resulting in a truly spectacular and impressive presentation.